Isn't she just gorgeous? Her beautiful hair and pretty seashell crown. This time I tried to mix oranges and pink for her hair, and a iridescent color for her seashell top and matching crown. 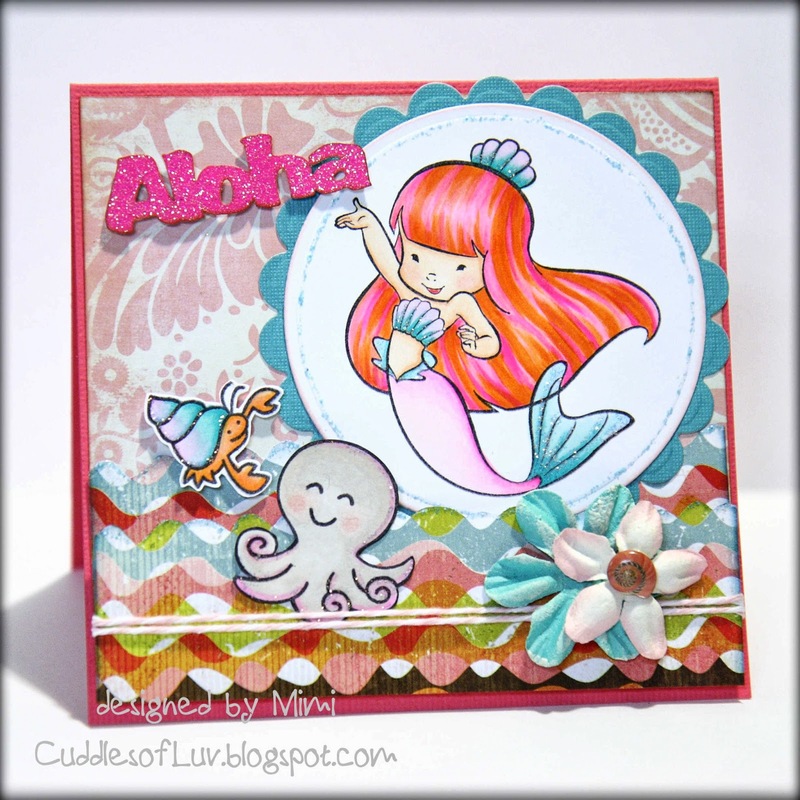 She has a couple of friends joining her in the colorful ocean water! The glittery "Aloha" cut-out is from Jenny (thanks Jenny! 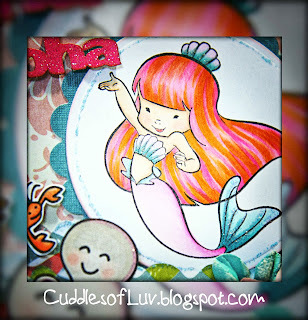 ), and can be purchased from Island Scrapbooking. Found a couple of old flowers in the perfect colors and added a tiny seashell in the center of one. Thank you Jenny for having me as Guest Designer for this fun, fun release! It's been a blast coloring the mermaids, and since summertime is here, I'll be making more projects with them soon! Also thanks to all of you that left me such sweet comments! It just makes this a perfect way to end this month! Make sure you stop at Debi's blog and the Sister Stamp blog, cause there's alot more to see! Sister Stamps is also releasing another set of the Zodiac Animals! Both releases will be available tomorrow June 1st! I LOVE her hair! The colors are so fun and vibrant and the LF sea creatures make such cute friends! Ohhhh...you did an amazing job coloring up Aurora's hair! Such fun happy colors...and her ocean pals are just adorable! Can you please you on my blog ... and if you want please you can become a Member? You did such a great job! Thank you so much for your help with this release! So beautiful! Love her hair color! This is so cool and beautiful! I love her hair! I might have to try that color combo! Great share! Adorable card! Such sweet images!! Great colors too!